Do your first few steps out of bed in the morning cause severe pain in your heel? Or does your heel hurt after jogging or playing tennis? Most commonly, heel pain is caused by inflammation of the plantar fascia – the tissue along the bottom of your foot that connects your heel bone to your toes. The condition is called plantar fasciitis. Plantar fasciitis causes stabbing or burning pain that’s usually worse in the morning because the fascia tightens (contracts) overnight. Once your foot loosens up, the pain of plantar fasciitis normally decreases, but it may return after long periods of standing or after getting up from a seated position. You’re more likely to get the condition if you’re a woman (usually due to high heels or pregnancy), if you’re overweight, or if you have a job that requires a lot of walking or standing on hard surfaces. You’re also at risk if you walk or run for exercise, especially if you have tight calf muscles that limit how far you can flex your ankles. People with very flat feet or very high arches are also more prone to plantar fasciitis. Plantar fasciitis usually develops gradually, but it can come on suddenly and be severe. Although it can affect both feet, it more often occurs in only one foot at a time. You’re more likely to feel it after (not during) exercise. If you don’t treat plantar fasciitis, it may become a chronic condition. You may not be able to keep up your level of activity and you may also develop symptoms of foot, knee, hip and back problems because of the way plantar fasciitis changes the way you walk. Orthotics are helpful in correcting your foot position, thus speeding up the recovery process. 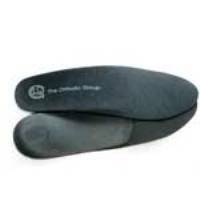 Custom made orthotics – Custom-moulded orthotics are foot supports which precisely align your feet and legs to help resolve pain arising from biomechanical misalignment. Custom orthotics are prescribed following a thorough examination which may include gait analysis and muscle/joint testing. They are not a miracle cure-all, but a part of your pain management, and a maintenance of your spinal alignment. ·Computer aided to allow precise alignment, by using digital and precise manufacturing. ·Possible to be made slim-line and fit into dressy shoes, or specifically for joggers and work shoes.